One of the best non-fiction films at the recent Palm Springs International Film Festival was BUZZ, a compelling and probing portrait of the Hollywood screenwriter A.I. 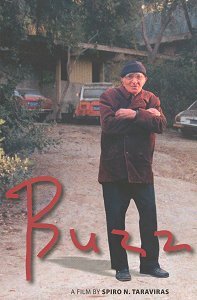 (Buzz) Bezzerides, written and directed by Spiro N. Taraviras. The two-hour, English-language documentary focuses on the colorful life of Bezzerides, who was born in 1908 in Samsun on the Black Sea to Greek/Armenian parents but raised in Fresno, where his best friend was the soon-to-be famous writer, William Saroyan. Bezzerides, alive and kicking today at 97, made his mark as a writer of such screenplays as They Drive By Night, Thieves' Highway, On Dangerous Ground and Kiss Me Deadly. Buzz grew up in a family that was poor and exploited, circumstances that colored his viewpoint as a man and as an artist. All his books and screenplays were about ordinary, down-to-earth people caught up in a bitter struggle for survival: truck drivers, farmers, sponge divers, petty criminals. The dialogue he put in their mouths was so pungent and memorable that he was often brought in to punch up existing scripts, sometimes by the studios, other times by such actors as Humphrey Bogart and Robert Mitchum, who also appreciated Buzz as a friend, thanks to his innate honesty and decency. Buzz was also close to the writers Raymond Chandler and William Faulkner during their time in Hollywood, helping them with their screenplays, driving them home when they imbibed too much. He also befriended many of the creative people who came under attack during the McCarthy era and were eventually blacklisted for their leftwing beliefs and associations. Because of the way he went to bat for them, Buzz himself had difficulties in landing film jobs. documenting his family background, talking with such colleagues as Jules Dassin (in Athens), Cloris Leachman, Terry Moore and Gloria Stuart. Rarely has a Hollywood screenwriter been given such attention, but Bezzarides does not disappoint as a leading man. Blunt and feisty in manner, he doesn't hold back when he's on camera, detailing the many times he was denied credit for major work, lied to and even cheated by producers and publishers. Today Bezzerides lives on a paltry Writers Guild pension in a ramshackle house in the Hollywood Hills. Widowed, fighting illness and bad eyesight, he may cut a lonely and shabby figure, but his idealism and social consciousness still blaze fiercely, lighting up Taraviras' remarkable film.